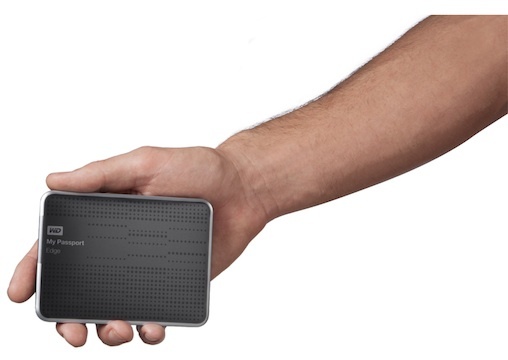 External hard drives are getting smaller and smaller as time goes on. The times of externals that look like portable desktop disk drives are gone for good. Western Digital’s announcement makes that clearer than ever. The company has released its 500 GB My Passport Edge, one of the more diminutive externals in the market and the smallest to come out of Western Digital. The Western Digital My Passport Edge weighs 9 ounces and measures only 4.34 in x 3.2 in x 0.5 in (length, width, and thickness, respectively), properly living up to Western Digital’s claim. The drive comes in two versions, one designed for PC and the other designed for Mac. The Mac version of the drive mimics the design aesthetic of Apple’s line of Macbooks and is even compatible with Apple’s Time Machine backup program; the drive is enclosed within an all-aluminum housing that’s equipped with a type of hardware encryption. Keeping up with developments in interface technology, the My Passport Edge has USB 3.0 compatibility, meaning a fast transfer rate that at its slowest is still double that of USB 2.0. The port is a micro-USB one; so naturally, the drive comes with its own one foot cable. According to some general testing, the external drive performs just about average for its capacity and price. It has an average writing speed of 83 MB/s and an average reading speed of 98 MB/s. The My Passport Edge will set you back $109.99 for the PC version and $119.99 for the Mac version. It’s not the thinnest external drive out in the market, but it does have a backup system that keeps your data secure. It works quietly, producing no vibrations and only minimal heat. A plus for user-friendliness, the My Passport Edge is easy to use for extra storage or as a backup drive. Aside from serving as a backup drive for laptops, it can make a good external for mobile users; its form factor is just as sleek and unobtrusive as current high-end smartphones. To guard consumers from accidents or manufacture defects, the drive comes with a limited warranty that lasts three years. This entry was posted in Apple, USB 3.0 Hard Drives, Western Digital and tagged 2.5 Hard Drive, External Hard Drive, Mac Compatible, Micro USB, mypassport edge, USB 3.0 Hard Drive, western digital. Bookmark the permalink.